Welcome to the Van Conversion series by us, Alpine Journals. Over the next many part series, we will be going through each part of the van, step by step. We will be talking about all the things we did right, the things we did wrong, how much time and cost each portion of the project required. We are far from complete on this particular conversion project, and there are a number of things we will be redoing as time goes on…. however we are pretty happy with what we have accomplished to date, and we are proud to show it off. 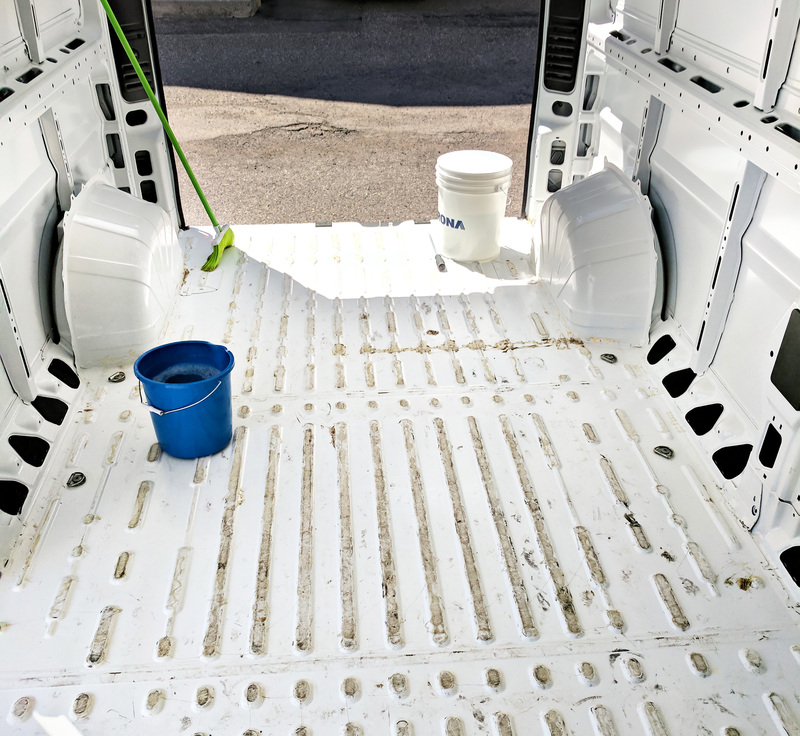 When we first got the van, it was completely full of… well gunk basically. It was a bakery delivery van prior to it’s life as a wanna-be vanlifevan, and you can imagine the kind of crap that builds up over a few years of baked goods transport. 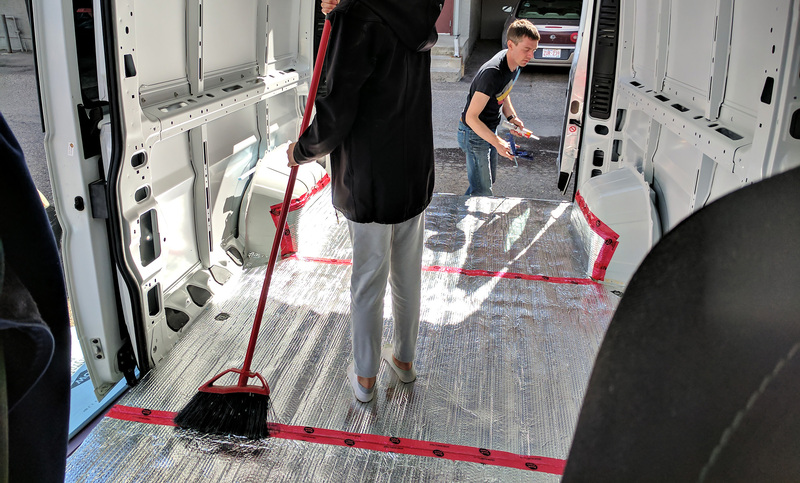 The first thing we did was remove the 3/4″ plywood subfloor (to be sanded and reused), and take the van to a DIY carwash to scrape out all the glue, baked goods, and give it a serious scrubbing. There are many schools of thought out there it seems like on reflectix. 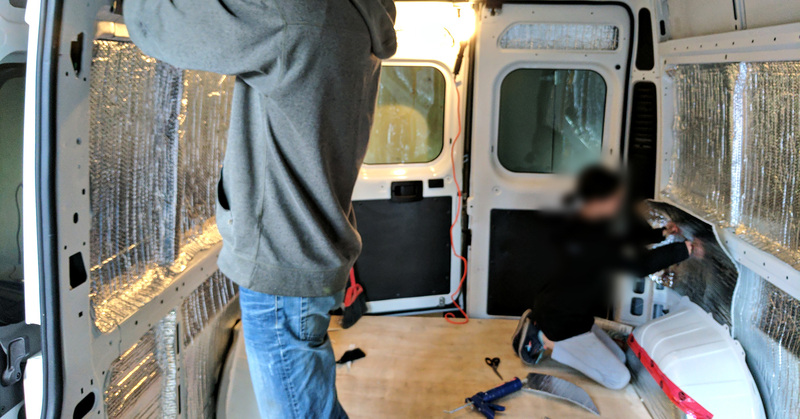 I personally am no expert, and if I had to do it over again it is possible I would do it differently, however I will outline how we did the reflectix in our van, and the idea behind it. In Canada, we have slightly different needs than someone who is building a van for a purely hot climate. Temperatures in the summer can range up to 35C, and then can go to -35C in the winter. If anything, our insulation needs are more specific to keeping heat in, rather than keeping the heat out. For this reason, we choose to add reflectix to the van with the shiny side inwards, in order to reflect heat back into the van during cooler temps, which account for over 60% of the year. 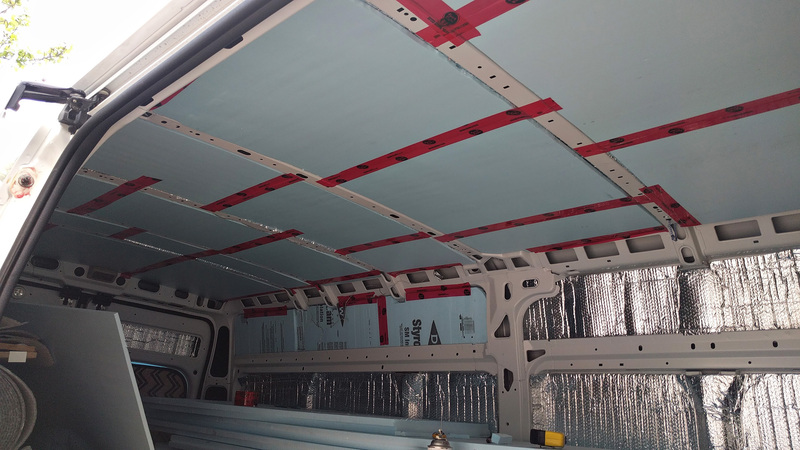 We added the reflectix to all panels of the van (ceiling, floor, wall and door panels) using 3M Super 77 Spray Adhesive. As per instructions, it is good to spray both surfaces (metal and reflectix), and then let them dry for a few minutes before applying. Think contact cement. We were able to pick up a large roll of reflectix (~100′) from Home Depot for around $100, and despite covering every surface, we still have a lot left over. We also made cut outs for the windows, and I would say that is by far the most important part as the cab lets in (and emits) a TON of heat, and is the primary source of heat loss (or gain). I’ve read often that it is important to give the reflectix a “layer of air” between the metal and the actual reflectix. Honestly, I only heard this on a video once, and it seems that everyone just glues the reflectix directly to the metal, so that is what we did. My argument is that it will likely be significantly better than “no reflectix”, and judging by how effective it is in the cab of the vehicle and the windows, i’m pretty sure it is doing quite a bit to help with temperature control. 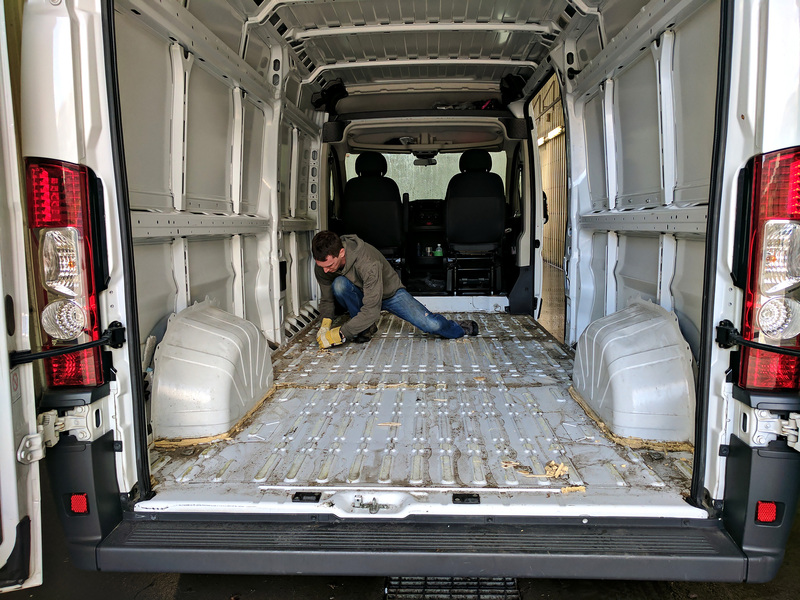 After the reflectix, we added various layers of hard cell foam insulation to the vehicle in all recesses, the floor, and the ceiling. For the floor we added relatively thick 2″ blue hard foam insulation. Due to our cold climate, we felt this would be a very important part of keeping cold air out from below. On top of the foam, we sanded down the existing 3/4″ plywood subfloor that came with the van and reinstalled it (it was in good shape, and cut perfectly to fit). 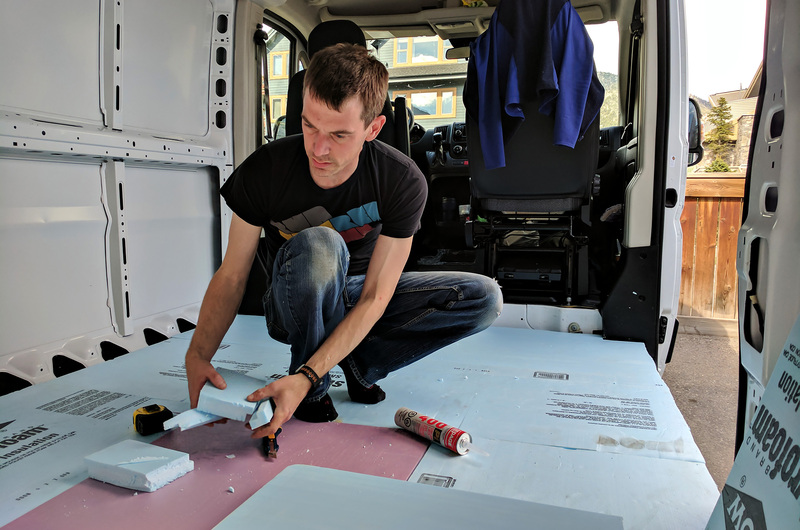 We determined that we could add this much floor insulation and still maintain a 6′ standing height inside the van… perfect for my 5’11” height. We used PL400 to glue the foam together, and to make it stick to the reflectix underneath. For the walls we used 1.5″ hard cell insulation, and for the ceiling we used 0.5″ insulation as that size fit perfectly between the ribs, given the 1/4″ of reflectix already glued in there. We used red tuck tape to hold everything in place. That stuff is AMAZING. Lastly, we used a bunch of spray foam to fill in various gaps between the isulation and the frame. To be honest, we didn’t add as much as we likely should have, however we needed to maintain access to the ribs in order to wire the vehicle. We did, however, set it up so that it would be somewhat easy to remove a few panels of siding in order to add more insulation in the future. We will see how that works out later…. We are somewhat expecting to re-do a good chunk of this in the future (including adding soft poly insulation in every rib, spray insulation, and re-wiring everything). But what we have should be good for at least 2-3 years. We will see how it works as time goes on.